Day 5 and lots of action! The seeds are very plump, the tails much longer, almost all the green skins have fallen off to expose an almost beige seed, which is starting to turn a purplish color on the ends. Opposite of the white tales, the seed is starting to split and a little green lizard like tongue is making an appearance. Tiny little leaves are starting to form as well. 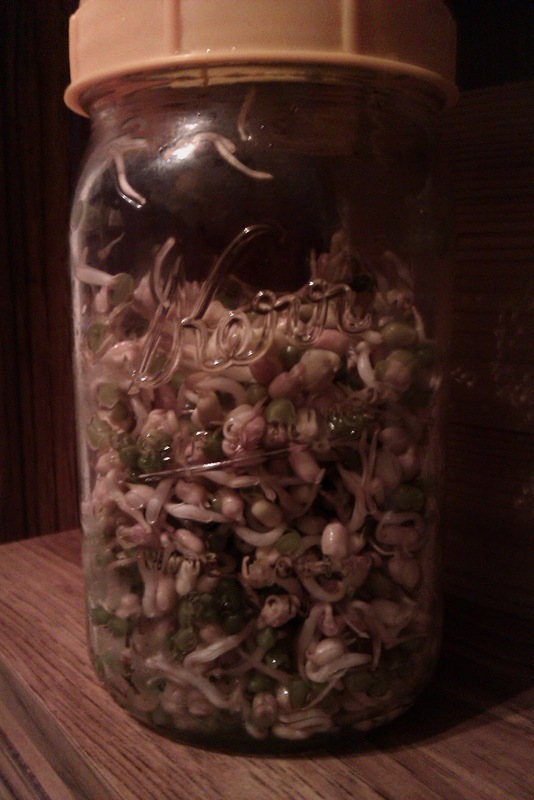 The bottle is 3/4 full and if these little guys aren't ready to eat soon, I'm going to have to take half of the sprouts out and continue growing in another bottle. My gut tells me these sprouts are not ready to eat, but I suspect any day now - Day 6!